I wasn’t sure if I really wanted to run this morning. The sky couldn’t decide whether it wanted to rain or not. When I stepped outside to do my last little bit of stretching and warm up, it was misting. I decided to go ahead and play a game of Chicken with Mother Nature. Fortunately, within the first mile, the clouds began to clear. The weather was perfect for the remainder of the run! All of the extra stretching and care lately has really started to pay off. The muscles in my left leg felt very strong today. With that, I decided to try out a few very mild Fartleks. Besides being a word that makes some people giggle, a Fartlek is a form of speed work. The word means “speed play” in Swedish. This training method calls for repeatedly switching the pace from normal pace to fast for some distance, then returning to normal pace. Typically a runner will pick a landmark – for example a tree, mail box, a power pole, etc. – and run to it hard, then back to normal pace until they have recovered. Then pick another landmark, run hard to that, recover and so on. The benefit is that you build endurance and speed during the same workout. My mild version of a Fartlek is to switch to faster paced music for a quarter/half mile then returning to normal pace. After a few more weeks, I plan to step up a few levels to speed work that will help me meet my time goals for the year. I completed my unofficial tour of Beaumont, CA. The A2B Route led down to West Ramsey Street in Banning, CA. I was able to do my post run stretch in front of Hal’s Horseradish Shop. Hal has quite the following. 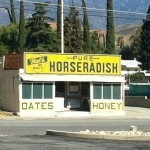 One fan says that for the horseradish connoisseur, Hal’s is nirvana. (I just had to use that quote because how many times have you seen the words ‘horseradish’ and ‘nirvana’ in the same sentence!) He also sells honey and dates. 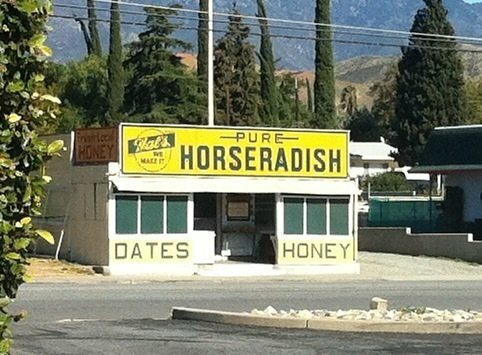 I wonder if there is a recipe that call for all three; horseradish, honey, and dates. Tomorrow, pressing forward to Cabazon!